Full Speed consumer with unique offerings, upscale amenities, new destinations, and a cleaner envi- ronmental signature. It adds up to an auspicious sector outlook. PortMiami and Port Canaveral. But frst they will need giant terminals. To that end, infra- structure spend at individual ports – here and beyond – is increasing to accommodate the anticipated 30 million global travelers expected to be counted as cruise travelers in 2019. That growth comes with new responsibility for CLIA members, especially in way of re- ducing their collective impact on the environment. It turns out that they are up to the task. IMO 2020 date would be pushed back was rampant within shipping circles well beyond 2015. Consequently, many non-passenger-ship owners held off. But, the cruise industry has been a leader – and continues that trend today. 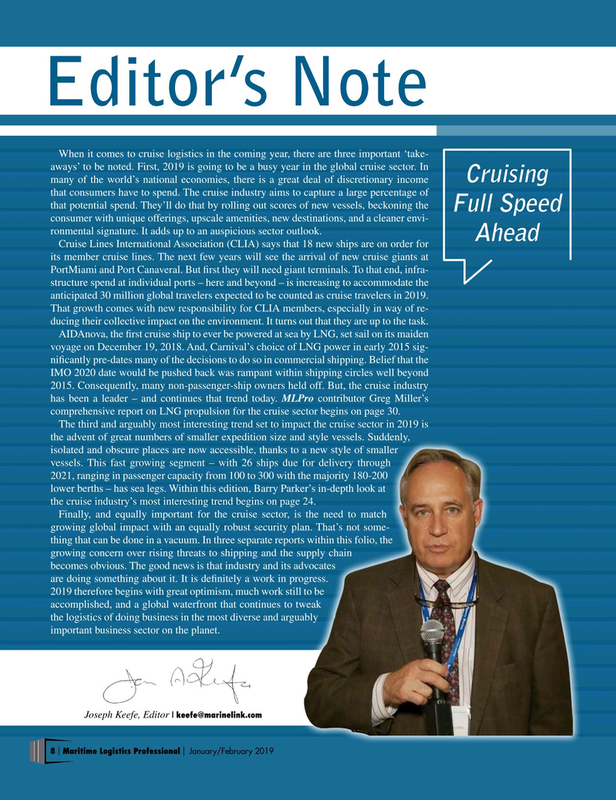 MLPro contributor Greg Miller’s comprehensive report on LNG propulsion for the cruise sector begins on page 30. The third and arguably most interesting trend set to impact the cruise sector in 2019 is the advent of great numbers of smaller expedition size and style vessels. Suddenly, isolated and obscure places are now accessible, thanks to a new style of smaller vessels. This fast growing segment – with 26 ships due for delivery through 2021, ranging in passenger capacity from 100 to 300 with the majority 180-200 lower berths – has sea legs. Within this edition, Barry Parker’s in-depth look at the cruise industry’s most interesting trend begins on page 24. Finally, and equally important for the cruise sector, is the need to match growing global impact with an equally robust security plan. That’s not some- thing that can be done in a vacuum. In three separate reports within this folio, the growing concern over rising threats to shipping and the supply chain becomes obvious. The good news is that industry and its advocates are doing something about it. It is defnitely a work in progress. 2019 therefore begins with great optimism, much work still to be accomplished, and a global waterfront that continues to tweak the logistics of doing business in the most diverse and arguably important business sector on the planet.